Two of our zines — Tweak, Tweaked, Tweet and Good Evening, good evening. So nice of you to come all this way — were included in The Centre for Fine Print Research Book Arts: New Wave: artists' publishing in the 21st Century, an exhibition demonstrating examples of concepts and formats of artists' publishing. Australian birds drawn with pen and ink by Louise and featured in neat formation. Birds include the Grey Currawong, Willie Wagtail, and the Brown Cuckoo-dove. Receive a little love with your cabbage roll; comb the lawns of Killarney in Ireland; and break a few roof tiles in Stockholm. A zine featuring original collage postcards and their imagined correspondence. 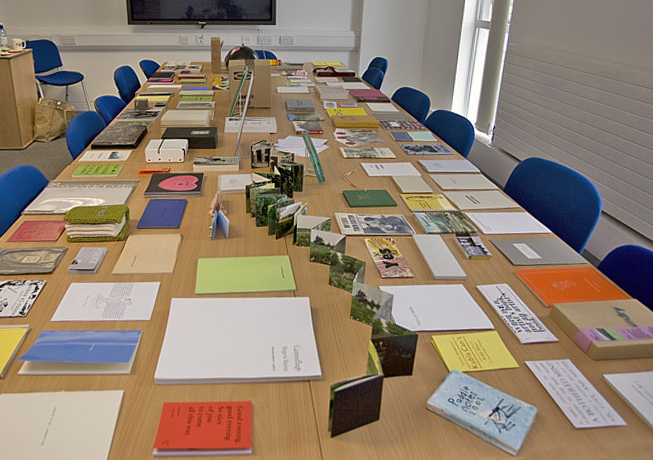 This exhibition forms part of a two-year AHRC funded research project which aims to extend and sustain critical debate of what constitutes an artist’s book in the 21st Century — in order to propose an inclusive structure for the academic study, artistic practice and historical appreciation of the artist’s book. New Wave is an exhibition demonstrating examples of concepts and formats of artists' publishing. The exhibition is displayed over two rooms, a hands-on room of 133 artists' books, and a reference book reading room of contextual publications, alongside which we are showing copies of altered Artist's Book Tree diagrams from our online artists’ books survey.